Horse lovers welcome the warm air of spring. The days are getting longer and the horses are happily munching away in the pasture. Unfortunately spring and summer bring with them quite a few unwanted guests. Many different types of insects bother horses. Come to think of it many of the same bugs bother me. Especially when I’m taking a nap and they fly right above my ear. The difference is I have the ability to hunt them down and finish them with my handy dandy fly swatter while my horses must struggle to escape them day in and day out. Flies tend to be one of the more persistent pests of horses. The dominant species in stables are the house flies and biting stable flies. Once outside, face flies, horn flies, deer flies and black flies become dominant. House flies do not bite, but, they can serve in the transmission of harmful microorganisms. Basically, the pests be divided into three groups by their feeding habits. Sponging mouth parts, found on house flies and face flies, are used to sponge or sop up liquid foods. 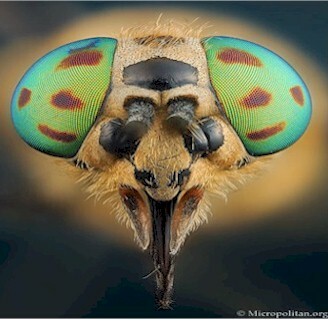 Stable flies, horn flies, horse flies and mosquitoes use piercing mouth parts to pierce the host animal's skin so that they may feed on blood. Some flies, such as bots and cattle grubs, have no mouth parts as adults. Stable fly bites are painful to both man and animal. When hungry, stable flies are quite persistent and will continue to pursue a blood meal even after being swatted at several times. Although the bite is painful, there is little irritation after the bite, and very few people exhibit an allergic reaction to stable fly bites. Other fly species that attack horses in pastures include horse flies and deer flies, black flies and other gnats,and mosquitoes. Flies seem to live to reproduce. A typical life cycle of a fly is 21 to 25 days from egg to adult, and do they sure do keep busy! A female fly often lays twenty batches of eggs during her short life span, with each batch containing between 40-80 eggs. In fact, two flies can easily produce 1.8 million breeding pairs within just 12 weeks. All the more reason for horse owners to become vigilant in their fly control efforts. I have decided to give Fly predators a try this year. My neighbor who owns the dressage facility next door has been ordering them for years and swears by them. She releases them two or three times each fly season into the manure pile and where they get to work right away. Fly parasites kill flies in the pupa stage before they hatch into flies. These are tiny wasps (the size of a fruit fly) that specialize in killing flies. They do not sting people or mammals. These insects are naturally occurring and widespread in low numbers. They just need reinforcement to exert fly control where fly breeding is abundant. 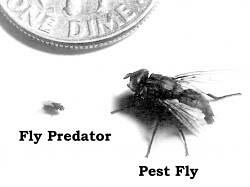 Fly predators are available from The Beneficial Insect Company in colonies of 10000-15000 insects. You can contact any of the companies that carry fly predators and they will work with you to determine the number of fly predators that you need. The number of fly predators needed based on the not only the number and type of animals that you have, but also the size of your pasture or stable and the conditions in your area. Pyrethrum? Pyrethroid? Permethrin? Cypermethrin? Tetrachlorvinphos? I counted a total of 57 different fly sprays in my horse supply catalog this month. So what are these chemicals we’re spraying all over our horses or misting throughout our barns? One of the most common ingredients found in many insecticides are pyrethrins. These poisons are extracted from certain species of the well known plant Chrysanthemum. Pyrethrins are effective insecticides and are fairly non-toxic to mammals, but one problem associated with pyrethrin use is the propensity of this extract to become allergenic. 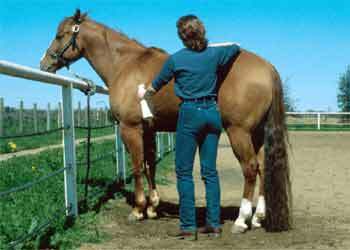 Contact dermatitis (blisters, rash or general irritation) is a common reaction in both humans and horses. People with sensitivity to ragweed or who have asthma can also be sensitive to pyrethrins, with symptoms such as sneezing, headaches, stuffiness, eye burning and itchiness. These products should not be applied near your horse’s eyes or other sensitive areas. Pyrethroids are found as the active ingredient(s) in many fly and mosquito sprays, this class of man made chemicals are manufactured to produce the same type of chemicals found in chrysanthemums. Permethrin is a neurotoxin, a possible carcinogen (cancer causer), known mutagen (damager of genetic material), and suppressor of the immune system. It kills insects by over-exciting their nervous systems. In mammals, it also causes repeat nerve impulses which can lead to tremors, hyperactivity or paralysis. Because of the way they work, pyrethroids can also create problems for people taking medications for multiple sclerosis (MS). Given all these problems,I advise considering other options before using pyrethroids. I started making my own fly spray last year and I was quite pleased with the results. The only downside is that in my experience the natural home made sprays don't have the same staying power as some of the store bought chemicals. It really hasn't been an issue for me as my horses stay in during the day in summer with evening turn out. I spray them twice a day with the homemade spray. In the morning and after dinner before turnout. I have included the recipe below. Be sure to spot test your horse before using. Fill remainder of ½ gallon container with water. 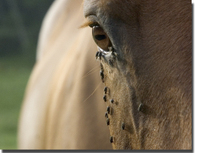 Fly masks protect a horse’s eyes not only from these pests but also harmful UVA and UVB rays. For fly masks to be effective, purchase several and wash them regularly. If grit gets underneath or on the band, it can be very irritating to the skin. Do not buy ones pre-coated with pesticides. Also, do not leave the mask on continually; remove it at night. 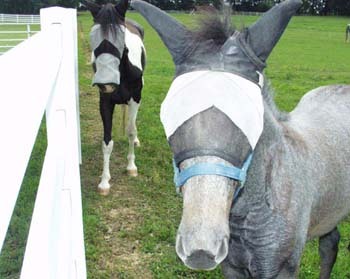 If you own a horse with uveitis (moon blindness) I highly suggest purchasing a guardian fly mask. The Guardian Mask does a lot more than keeping the flies away. The sunshades provide 95% protection from harmful UV sun rays, allowing full visibility without compromising safety and comfort. 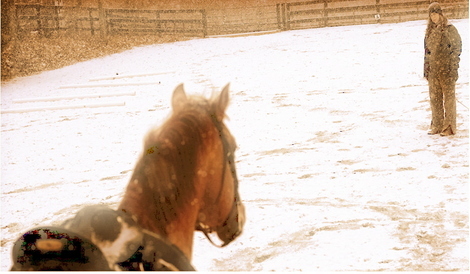 This mask has made all the difference with my ERU Appaloosa Bailey. He is finally able to go out in the sun and graze with his buddies again. Another mask I am considering this year is the "Quiet Ride" fly mask which was created for use underneath of the bridle. I have yet to try this product but I think its a great idea. On cooler days, fly sheets can also protect not only against flies, but also pasture bleaching. The rest is just a matter of common sense. One of the easiest ways to reduce fly populations is to eliminate the breeding habitat. They require organic matter, such as manure and bedding material, moisture and warm temperatures. The elimination of any one of these factors will minimize fly breeding. 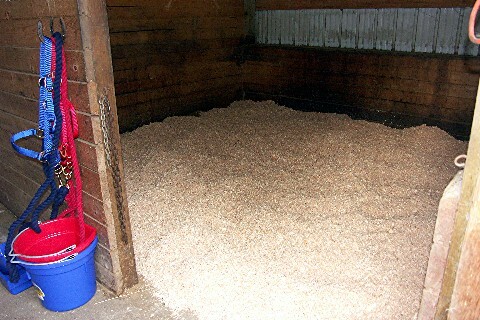 Clean stalls daily, remove stagnant water from troughs and scrub often, keep aisle ways cleaned up and don't let your manure heap get out of control. There are tons more products and ideas out there aimed at fighting flies. I include a few interesting links that I came across during my research below. I'm not sure if the "fly gun" is for real but it sure does look fun. 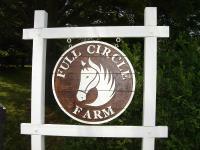 I was recently asked to write an article for infohorse.com about my experience at Meredith Manor International Equestrian Center. An article from the perspective of a graduate about how I made the decision to go and where I am now. I gained so much in my years there that I was happy to tell my story. 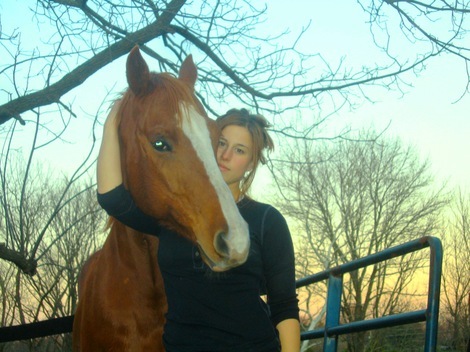 I have dreamed about a life with horses for as long as I can remember. Growing up just outside of Washington D.C. the opportunities to pursue such a passion were limited. It seemed that either you were born into a life with horses or you had to be wealthy enough to afford lessons. Unfortunately I was neither. So I did what every horseless girl does. I read books and watched movies. I studied the breeds and their colors. I spent hours in my room flipping through magazines carefully debating which horse I would someday choose. I clipped classified ads of “free to a good home” horses and houses for rent in the country and attached them to my Christmas list. I started saving my money in a horse jar where I happily accepted donations. Time goes on and horseless girls grow up. I rode over the summers when ever I had the opportunity, but as I transitioned into adulthood my dream of a life with horses fell by the wayside. It was time for the real world. I had to be practical. I had to make money. So I spent the next several years talking myself into wanting something else. I sold cell phones, I became a pharmacy technician, I took real estate classes, and I worked as an office manager for our family business. You name it I tried it. I was successful enough. I owned my own home and I had some money in the bank but the truth is I was miserable. I was just biding my time and I felt like I had no real purpose in my life. One night I was home feeling sorry for myself and I got online to look at horse sites. I began to search for horse related jobs and stumbled across the Meredith Manor site. I began reading Dr. Meredith’s training articles and couldn't stop. I stayed up arguing with myself about whether or not to fill out the form requesting information. It was only a catalog. What harm could it do? The entire next week I ran home to check my mailbox for the package. When it arrived I sat down next to the mailbox and ripped open the envelope. As I flipped through the pages my mind began to race. What if I could do this? What if I sold my house, and my car, everything but the dog? What if it’s not too late? A lot of thought goes into the curriculum at Meredith Manor. As you progress through the levels of riding, training and theory your strengths begin to surface. Interestingly many students end up changing their major along the way, specializing in something completely different than they intended. I thought I wanted to be a trainer. After all, the dream was to work with horses so why bring people into it? While I learned a lot from my training classes I found myself drawn more and more to another area of study. A new passion began to emerge when I discovered teaching. What makes the teaching program at MM so different is that we are required to become a teacher first and a riding instructor second. A great deal of time is spent studying the aspects of communication and different methods of teaching different learning styles. We learned to incorporate our working knowledge of horses with the ability to communicate and motivate our students. After my first student I was hooked and I knew this is what I was meant to do. The only thing that made me happier than making progress with a horse myself was the ability to help someone else have that same experience. Teaching is truly the best of both worlds and I can’t imagine anything I’d rather do. Graduation was definitely a bittersweet time for me. I said goodbye to my new family as they moved on to their new lives and I made the decision to stay. I was accepted into the graduate assistant program where I was able to continue on as a student teacher and gain invaluable experience. When I finally left the manor I had accumulated almost 2000 hours in the saddle under some of the finest instructors in the world. It didn’t matter what I started with or how long it took to get here. I was a new person, full of the confidence that comes along with realizing a dream. This achievement was only the beginning. I had a solid foundation to continue on my own, to set new goals and realize new dreams. 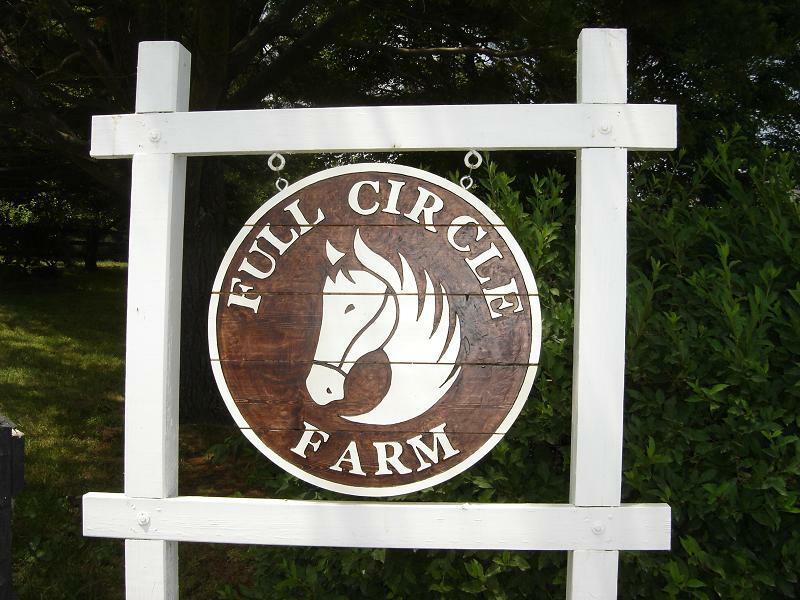 I have since acquired my own business in Virginia where I teach, train and ride everyday. Making a decision to change the course of your life can be very difficult. No matter what your dream is there are always obstacles and often many more nay sayers than believers. Wanting to be something more than what you already are, even if the comparative greatness is only in your own eyes, is something that ought to be worthy of encouragement. I have learned that pursuing a dream is never ending. No set goal achieved satisfies. Once you find you are able to accomplish more than you imagined you will begin to wonder what else you can do. I will always look fondly upon my time at the manor. I am grateful for all that learned there, for the blood sweat and tears, and the lifelong friends. I am happy to be where and who I am today and I can’t wait to see where the journey takes me from here. Scientists in Switzerland recently conducted a study hoping to quantify the equine attention span. 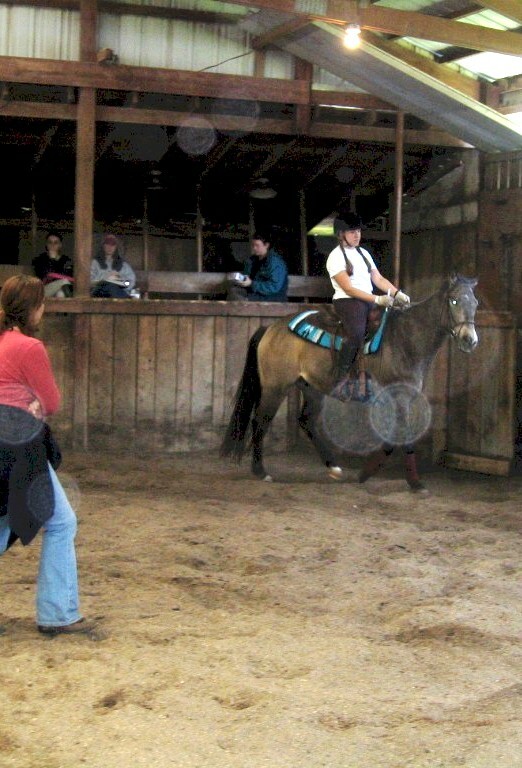 They taught the horses in the study to touch an object after specific cues were sounded, and the animals were given a reward for a positive response. If the horse touched the object before the cue was given, they did not receive a reward, meaning they had to wait. 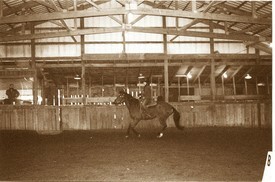 The time between the cues was extended during the experiment phase to measure how long the horses retained their focus. Researchers found that the average maximum attention span of horses is 11.8 seconds. The study also found a significant difference in the ability of young horses (3 to 7) and older horses (8 to 14) to hold their attention and retain information. An 11.8 second attention span is extremely short. To put this into perspective, the average amount of time that a two year old human child is able to concentrate on a particular task is about 6 minutes. To the untrained eye watching a finished horse it may appear that the handler has continuous attention. In a sense this is true but not in the way you might think. He appears focused on the person directing, never drifting or wandering. This level of concentration comes from the trainer or rider directing every stride. Constantly giving the horse something to do. 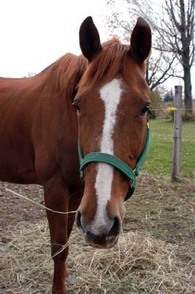 Lack of attention is especially common in younger horses. It is virtually impossible to expect to complete an entire training session with a two year old without having his mind wander at least once. So what can we do? How do we fix the problem of a horse that seems to take interest in everything but us. Well, there is some good news. Horses are not just easily distracted they are also easily fascinated. 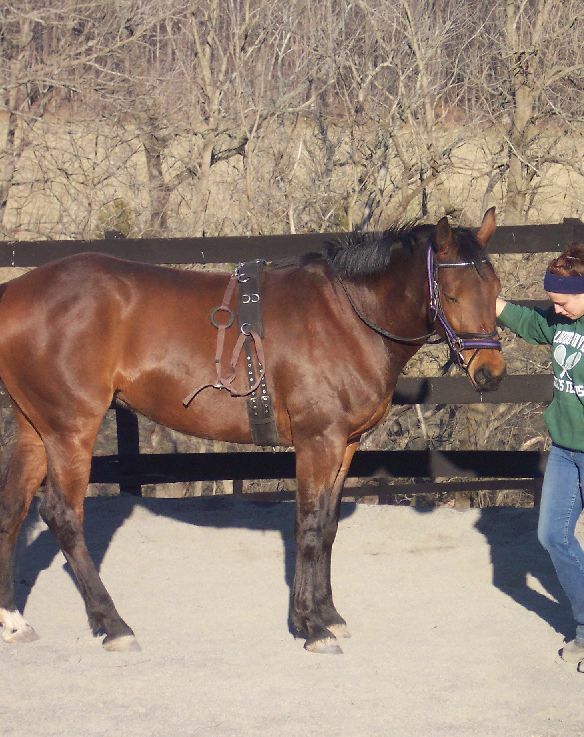 When teaching a new horse to heed, I pay very close attention to the body language of the horse. When turning him out in a round pen I follow behind from a distance. At this point the horse is free to do as he chooses to an extent. He can run and play he can roll on the ground kick invisible monsters... whatever he wants. At some point he will either stop and look at me or walk over to say hello if for no other reason than to see why I keep following him around. Now I have his attention, but this is just the beginning. Getting a horse to acknowledge you is easy, keeping a horse waiting for your request is a bit more difficult. Horses only pay attention to one thing at a time so if his ears perk forward to see a dog rustling the bushes you've already lost him. If he bends down to smell a pile of manure... guess what? That pile is more interesting than you are. 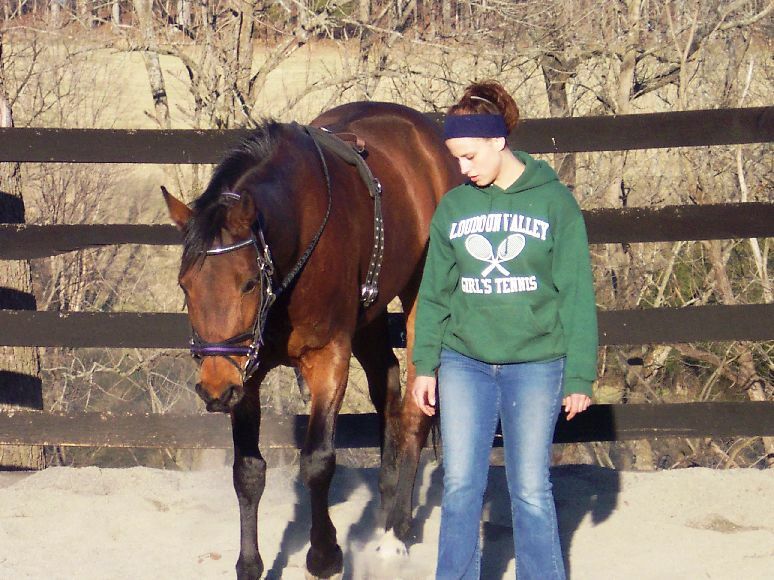 The trick is to keep your horse attentive with constant redirection. I don't mean frantic chasing him with a whip or changing direction every lap around the pen. Depending on the level of sensitivity it can be as subtle as tapping the palm of your hand on your thigh or making a little shh shh sound. The sound or movement is not as important as learning how much pressure is enough to get them back without loosing the relaxation. His inside ear should be either flicking toward you and then forward or staying on you, if it isn't then hes already somewhere else. Whether your training your horse or riding him you have to have a plan. I don't mean you have to plan each ride or session in advance (although many trainers do) I simply mean as your riding or working a horse on the ground be planning the next step as your going along. When things start to go wrong in a training session, it's usually because the trainer had a lapse of attention. They took their attention off the horse so the horse's attention wandered, too. Or the handler was not clear enough about the shape he wanted the horse to take. If you leave a horse to decide where he wants to go and what he wants to do, chances are its not going to be what you would have chosen for him. If you expect attention from your horse you need to learn to be in the Now. Horses are here right now, they are not worried about how they did yesterday or if they will be ready for the show tomorrow. The "now" is only today, only this second, this movement, this breath, now,now,and now. Are you with your horse? Does your mind drift while you work him? Are you thinking about an argument that you had earlier or whats for dinner later. It makes more difference than you might think. I have seen the following scenario many times. Jane takes Trigger out of his stall and begins to tack him up. Susie stops with her horse and begins talking to Jill. Entrenched in conversation they fail to notice the body language of the horse growing increasingly impatient awaiting his next command. He begins to shuffle his feet, bob his head. Then he begins moving off to the side and still no direction. Then all the sudden they are taken by surprise when Trigger reaches over and takes a big bite out of Jill's shoulder. Then comes the shank "What's wrong with you?!" You know better than that! Is that a laps of obedience? Yes, but it's a lapse of obedience because the trainer let the horse's attention wander. 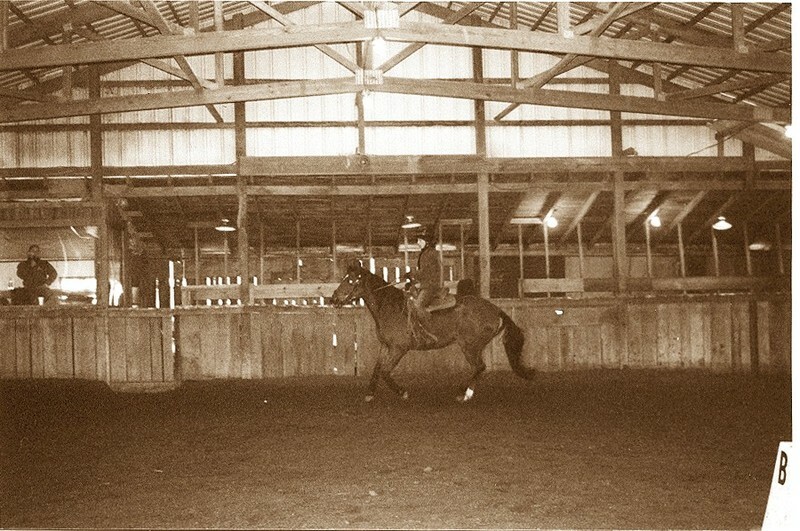 Now you storm of the round pen to get this horse to work, you've lost the relaxation and your temper and have probably convinced yourself that your horse is in a foul mood. 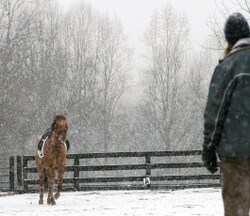 Fixing problems before they start only happens when the handler is aware of the horses attempt to communicate. Nothing happens out of the blue. Horses don't just decide to misbehave without warning. If your paying attention you will feel the tension before the spook, you will see the change before the action. The second your focus fades so will theirs. It is hard work to stretch that 11.8 seconds into a productive 30 minute work session. There is no such thing as a disobedience if you're not telling the horse what he should do. With horses you get what you give. Quiet concentration and relaxed focus are the first steps to producing great work. When you watch great horse and rider partnerships everything appears seamless. There is no visible cue, no tension and no resistance. There is only silent anticipation. If you ask your horse to focus on you every time you handle him, and you always give him the reward he is due, he will find pleasure in being with you and will want to be attentive to you. The next time you go out to work your horse give this a try. 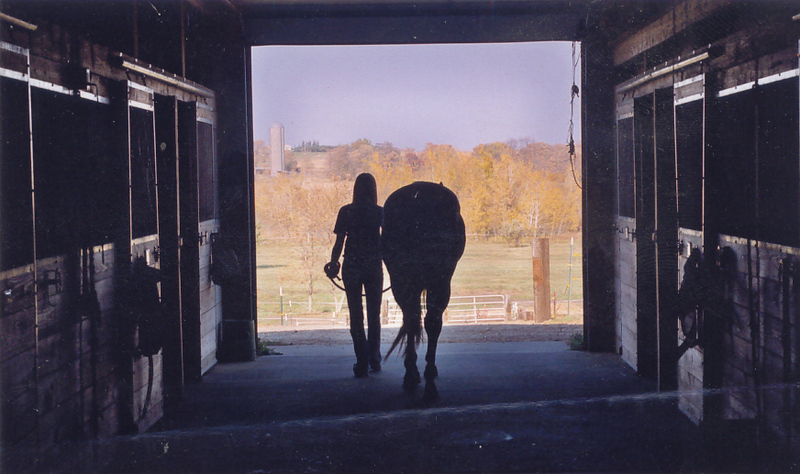 Leave your troubles at the barn door and talk to Susie before you greet your horse. 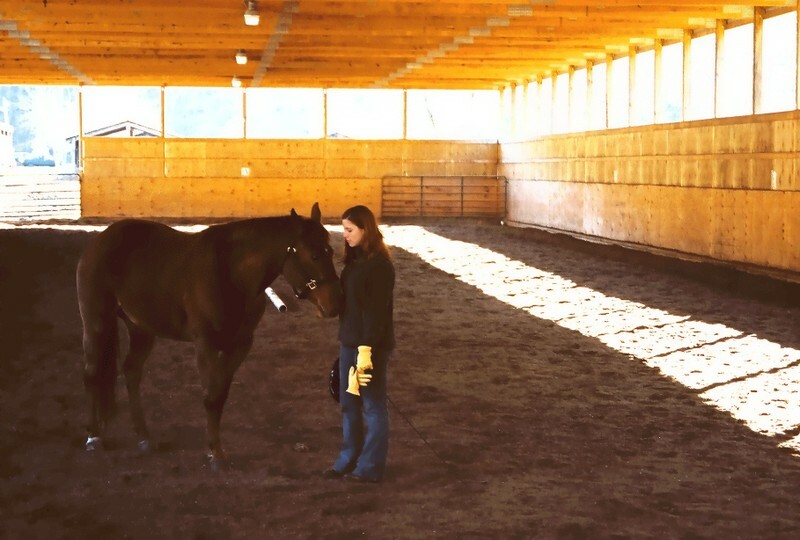 Dedicate one session to your horse alone. No distractions, no cell phones, no ipod, no thinking about work. Just you and your horse. Pay attention to his reactions, to his sounds, to his body language. Pay attention to him in the way you desire his attention. I guarantee you will notice a difference. I promise you will learn something new. With horses you get what you give. Are you giving enough?